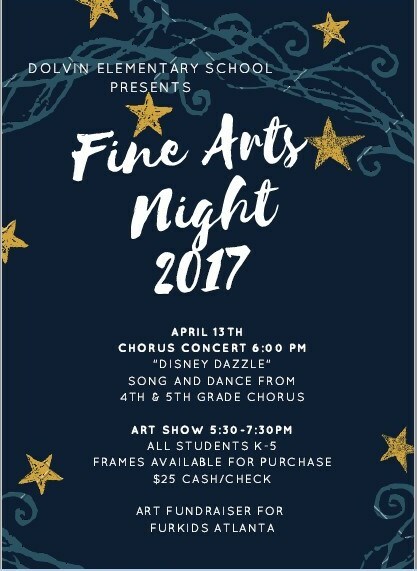 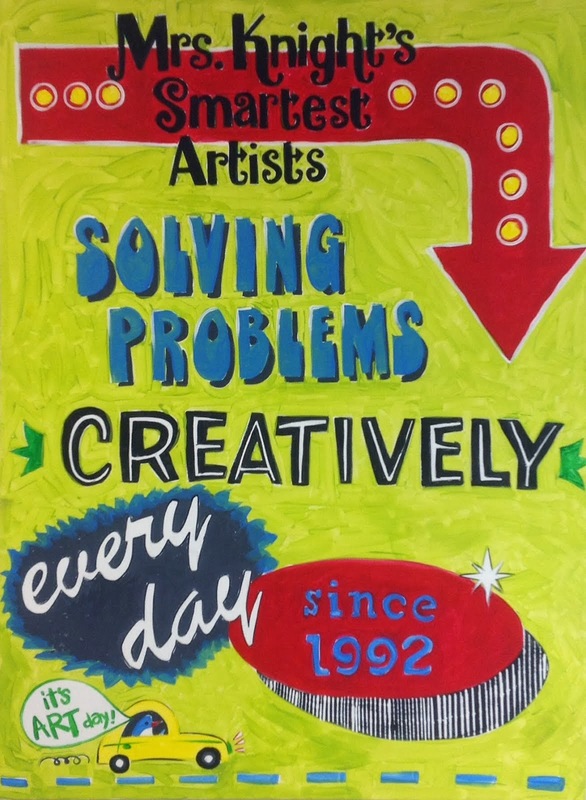 Dolvin's annual art show and chorus concert will take place on Thursday, April 13 - please plan for your family to attend! 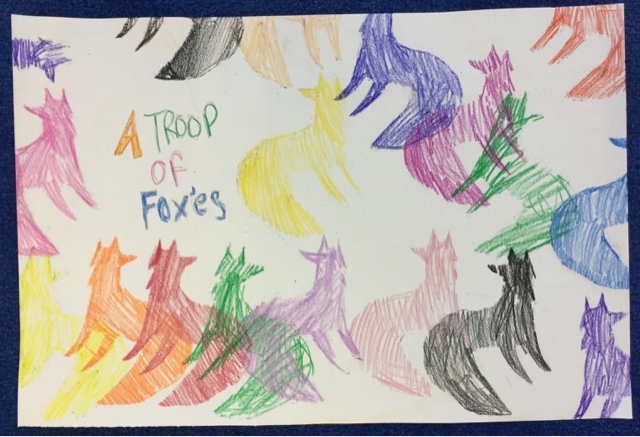 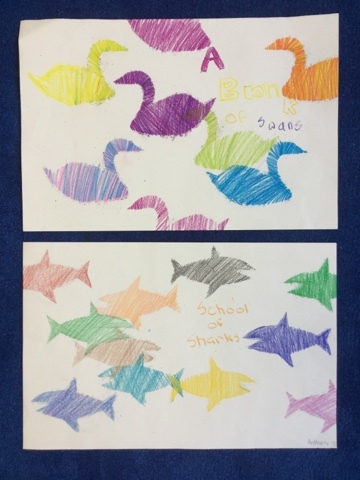 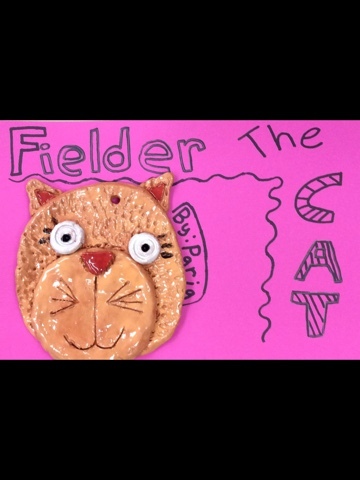 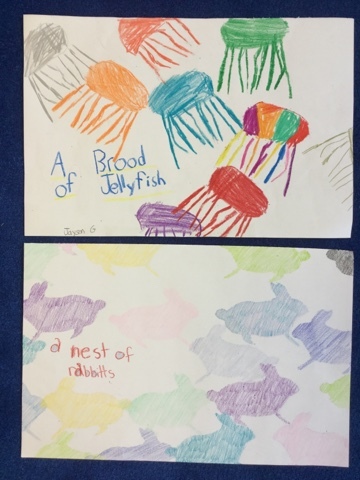 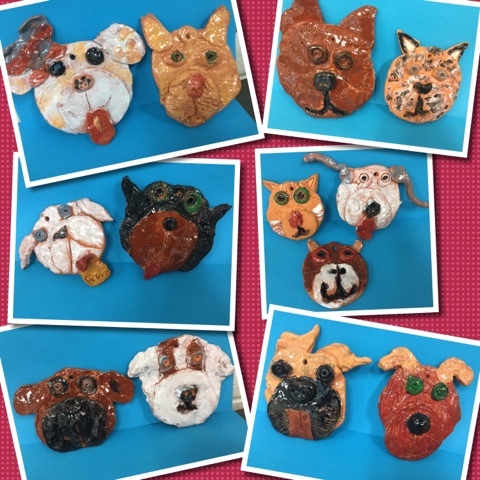 Students have been supporting the FurKids Atlanta animal shelter all year by creating and sharing artwork featuring the pets in need of homes. 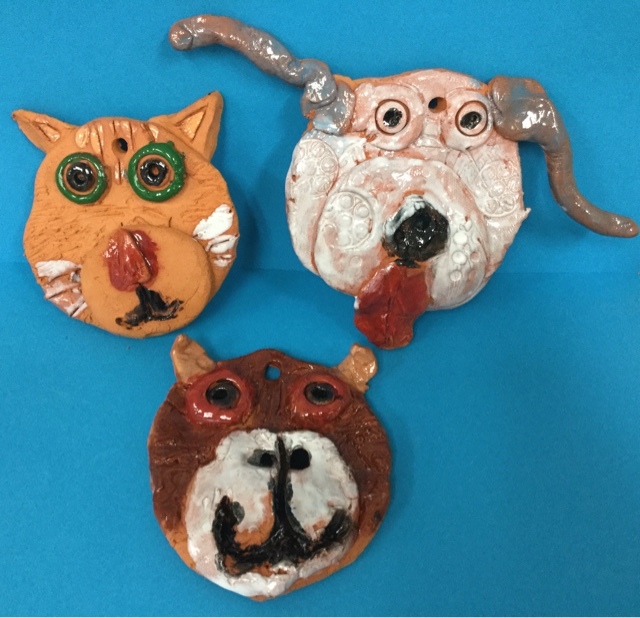 In art class, we have created some pawprint clay charms and pawprint crayons that we will sell for $1 each, and that money will be donated to the animal shelter. 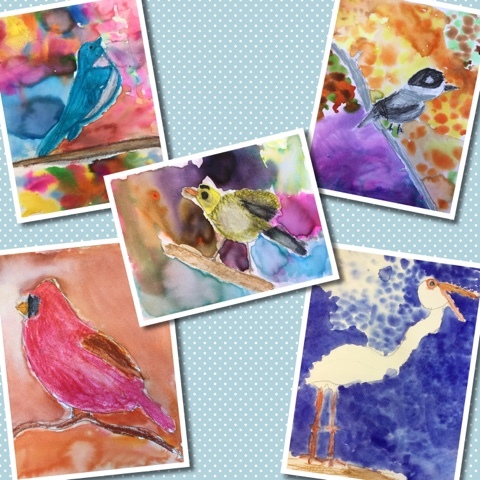 The art in the exhibit is not for sale, it belongs to the artists, but mats/frames are available for $25, and a portion goes to Dolvin. 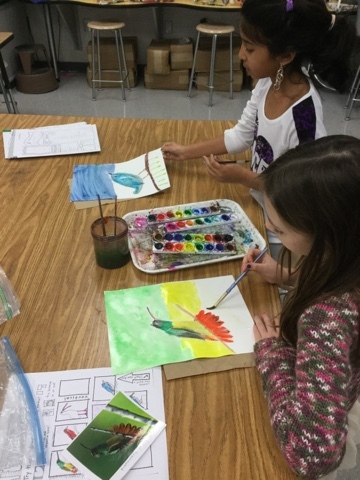 All artwork will be returned to the students shortly after the show comes down. 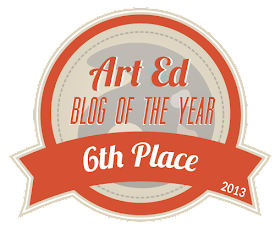 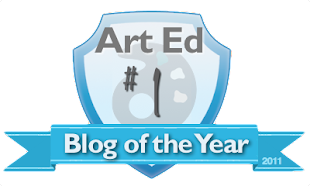 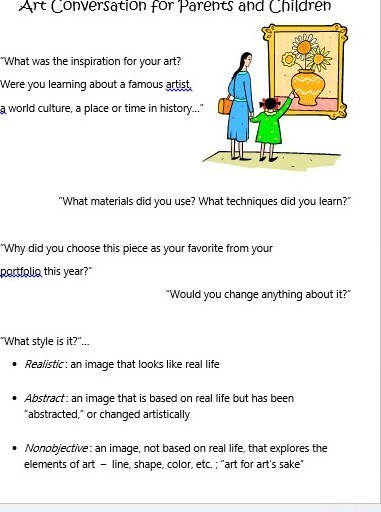 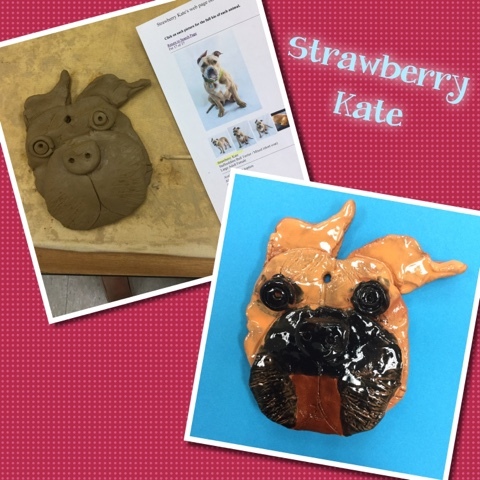 Please come and enjoy viewing our masterpieces and engaging in artistic conversation. 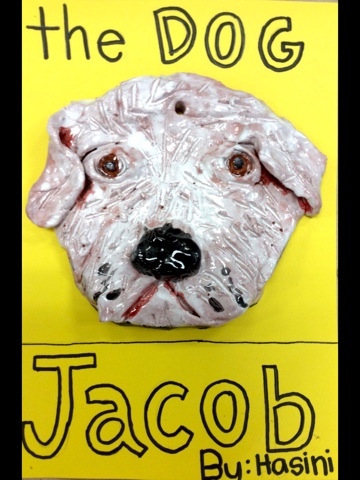 As a continuing project over the course of this school year, my students are creating art that celebrates the pets of FurKids shelter to raise community awareness. 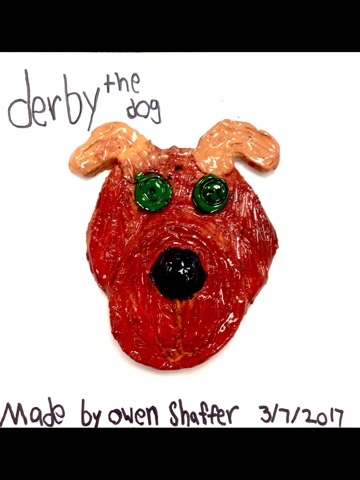 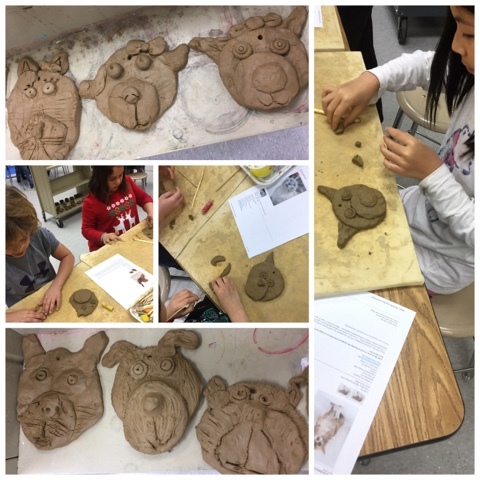 We began the year with drawings and tried collage around January, and now my second and third graders are using their clay building skills to create a likeness of these cute pups and kitties in clay. 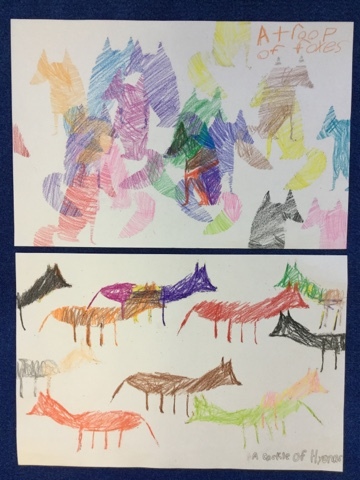 We started out by forming two small slabs and joined them together, then added features and surface textures. 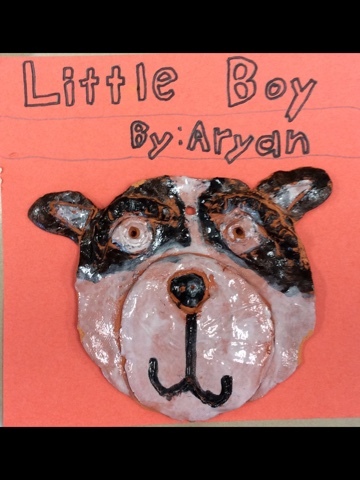 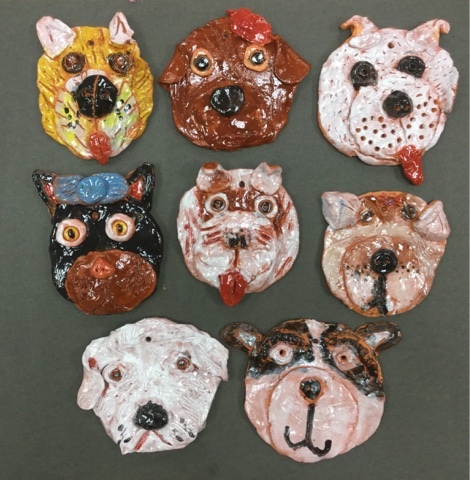 After the first firing, we glazed them and fired again - the kids did their best to really get a good likeness, and they researched the pets to know more about their personalities. 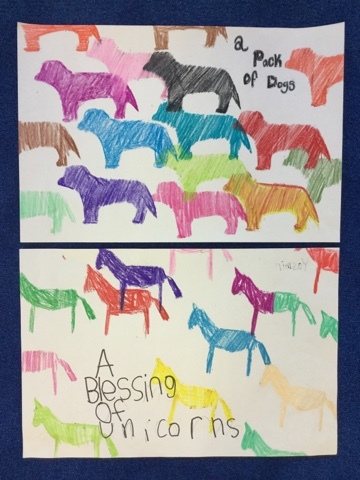 We have been sharing these on social media to promote adoptions and donations, and the students are very proud of helping their community. 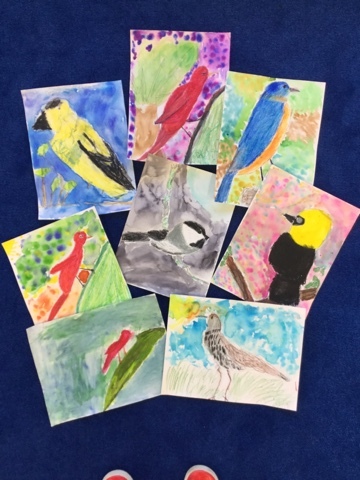 Birds are such a beautiful subject for art with their vibrant colors and interesting settings - many artists like J.J. Audubon and Charley Harper studied and painted birds for years. 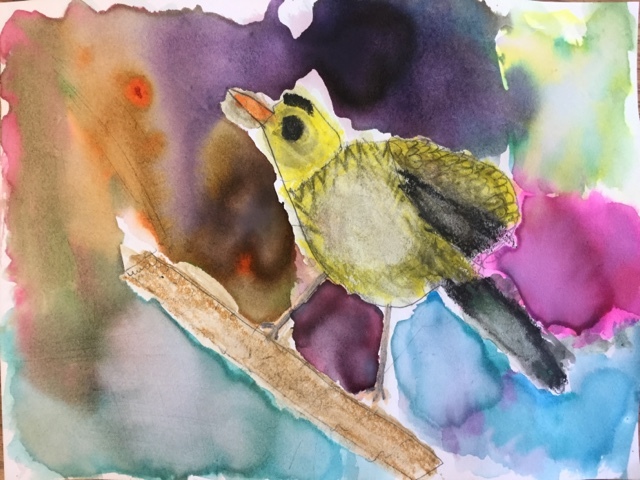 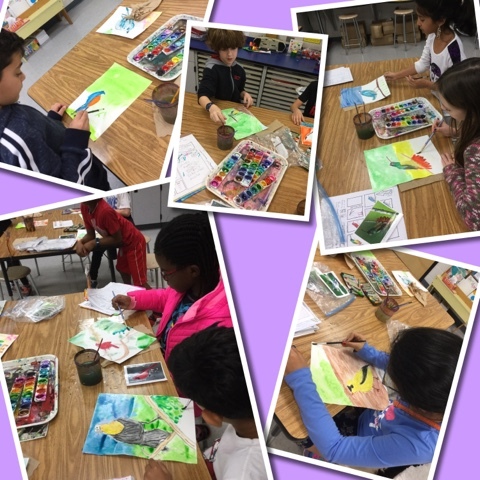 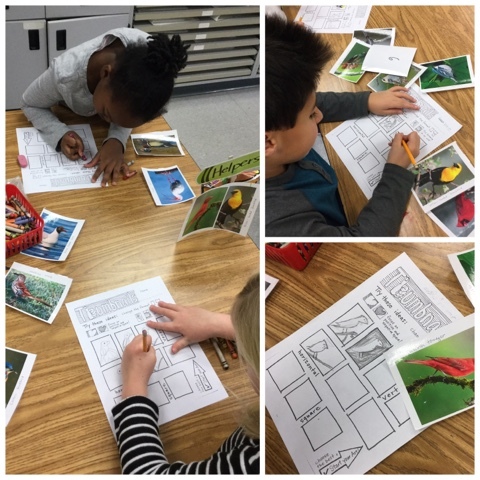 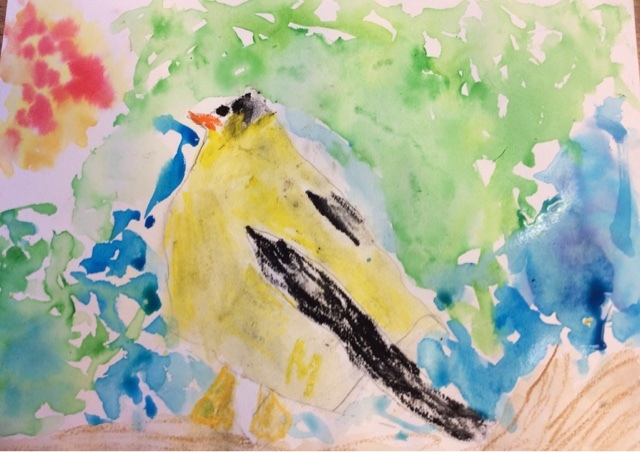 Third graders looked at a variety of native birds to our state and experimented with thumbnail sketches before starting a larger final copy on watercolor paper. 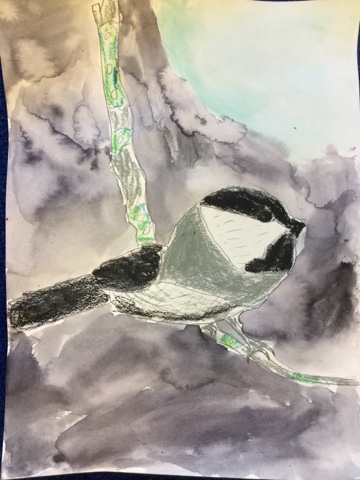 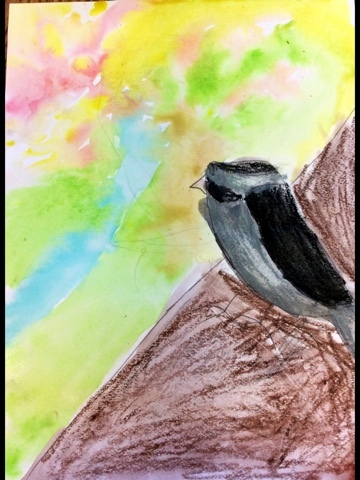 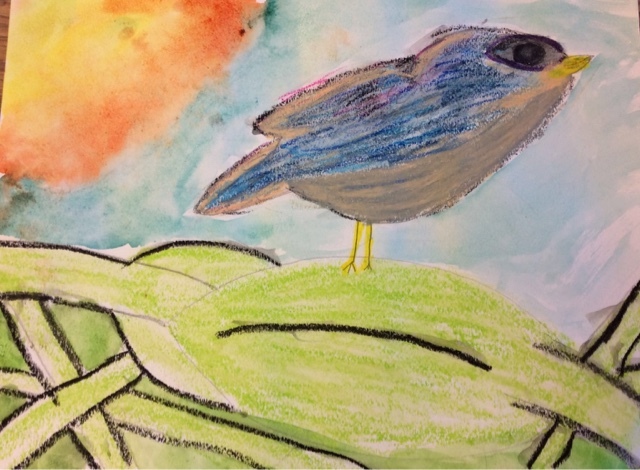 We used water soluble pastels for the bird and foreground, trying to capture texture and detail. 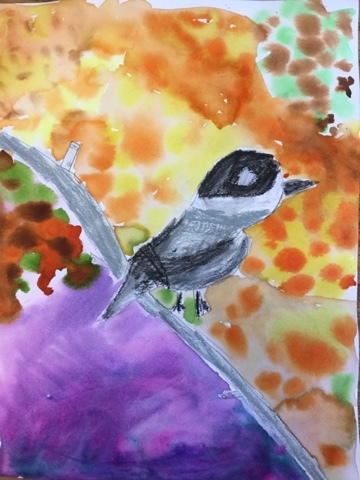 We used an atmospheric perspective technique for the background to create some spatial distance called wet-on-wet. 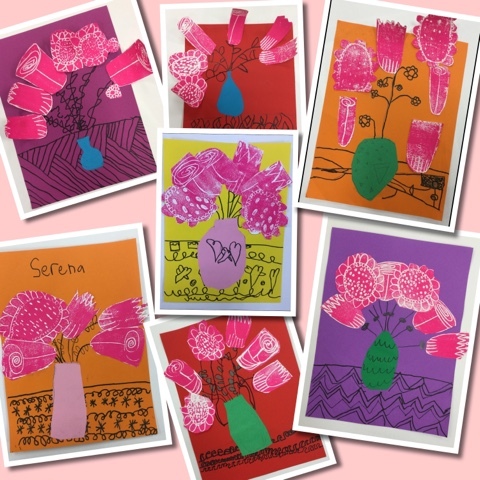 These are beauties every year! 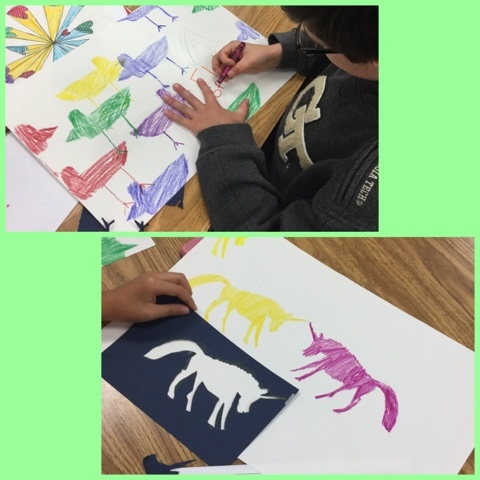 Fourth grade students explored positive and negative shapes, silhouettes, and stencil making with this lesson. 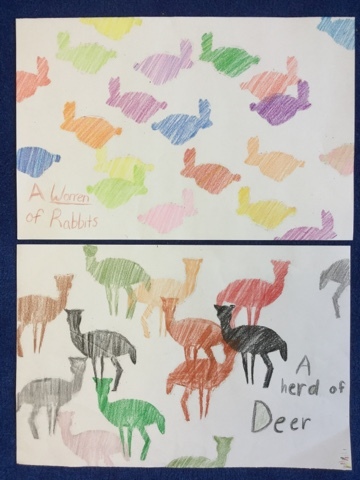 We also found the proper collective noun name for groups of animals. 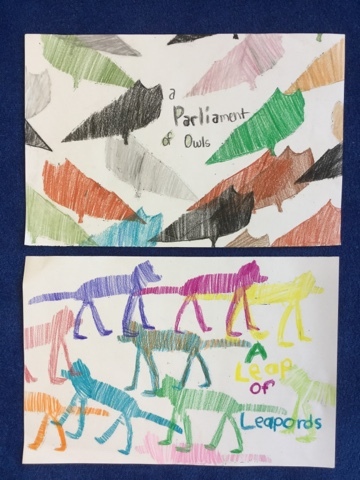 I think these are just super cool and graphic! 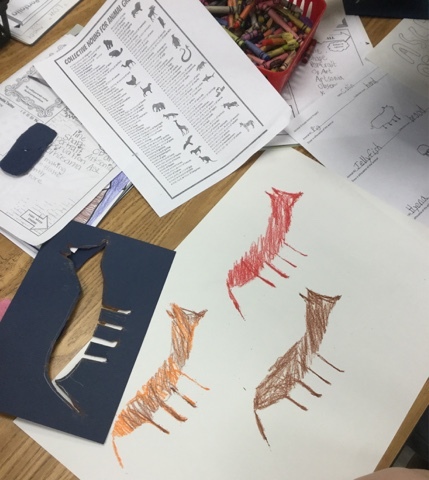 We used a thick cardstock for the stencil and looked up animal silhouette shapes on our iPads for research - a silhouette has to be recognizable by the shape only with no inner details. 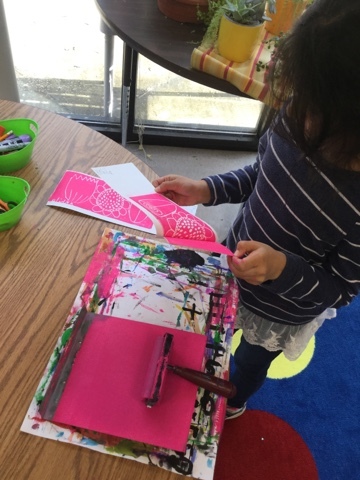 Drawing and cutting a silhouette stencil was slightly trickier than we thought at the onset, but we persevered with great results. 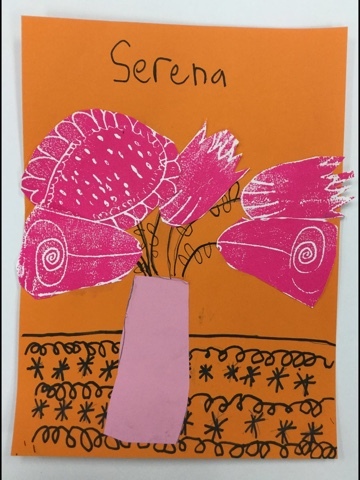 First graders continued their exploration of Nouns in Art - people, places, and things - with a mixed media still life. 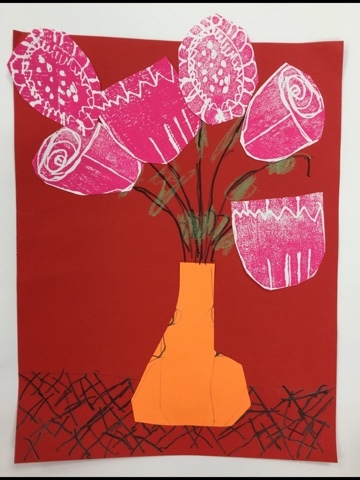 We looked at Van Gogh's sunflowers to get an idea of our composition, and we made a simple tabletop and vase. 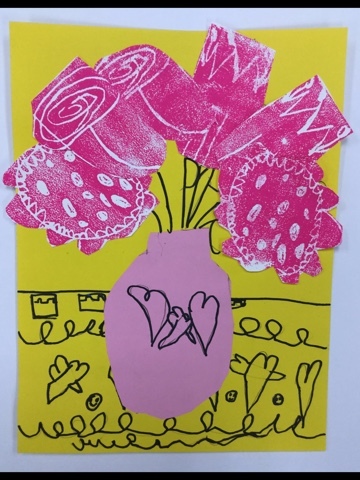 On a sheet of printing Styrofoam, we drew different shapes of flowers like roses, tulips, and sunflowers. 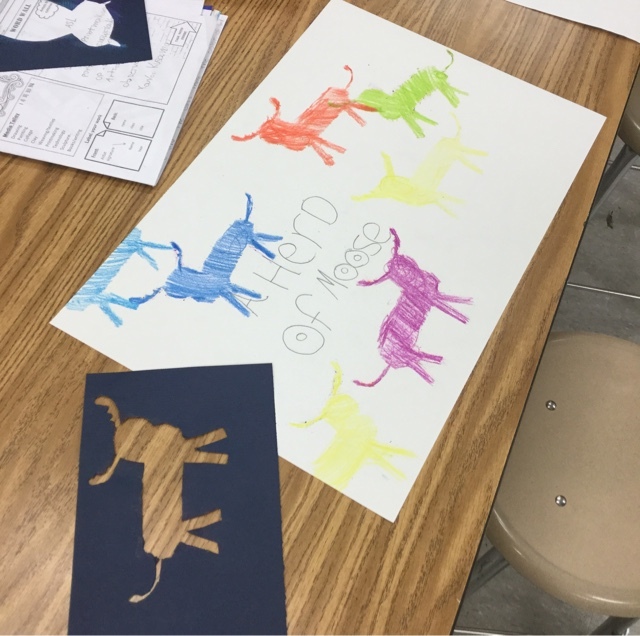 We printed them using printing ink and cut them out to add to the picture. 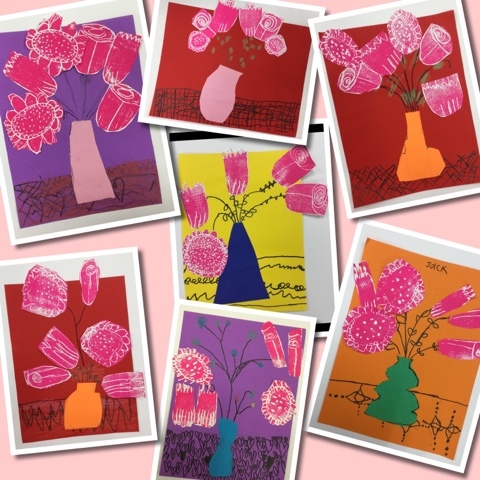 Andy Warhol is a great example of an artist who uses flowers in printmaking. 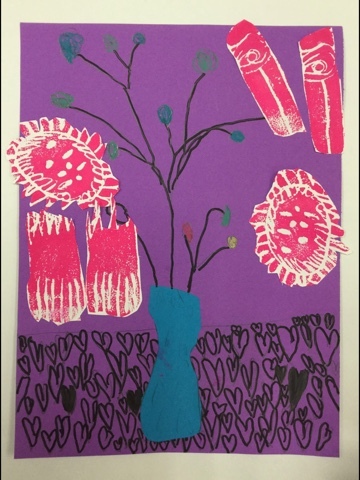 Thanks to Arteascuola.com http://arteascuola.com/2017/01/flowers-printed-with-craft-foam/ for the inspiring idea!